The owners of the new Basketshop Gallery pledge to keep conversation and hospitality flowing in a working-class neighborhood not accustomed to alternative art practices. The new Basketshop Gallery in Westwood found the perfect icebreaker for its opening: Maker’s Mark with a generous slice of (Home Depot) orange. 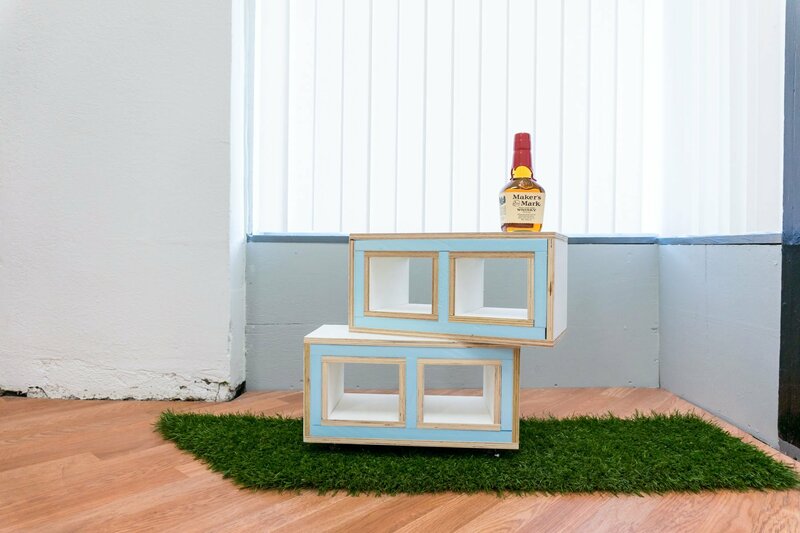 The bourbon bottle, part of an exhibit titled How to Make Enemies Friends, sits empty now, but gallery founders Eli Walker and Kelly Kroener pledge that they’ll keep the conversation and hospitality flowing in a working-class neighborhood not accustomed to alternative art practices. “There’s nothing really intimidating about art that I know of,” says Walker, a painter and basketmaker. But he and Kroener, who creates art with textiles, understand that other people have preconceived notions about contemporary art and galleries, so they are taking baby steps as they introduce themselves to the West Side and try to fit in in their own way. Recognizing Cincinnati’s traditions of quality craftsmanship, they chose the labor-themed art of Ryder Richards for their first show, which will be up through Sept. 9. …the common experience of a trip to the hardware store, plus a shot of hard liquor, can help turn foes into friends. Richards, of Dallas, has combined sophisticated ideas with utilitarian building materials for an exhibit that is contemplative yet doesn’t take itself too, too seriously. His beautifully drawn portraits of orange clamps, vises and buckets rest on sawhorses. The Maker’s Mark bottle sits atop wood-and-foam “cinder blocks.” During a conversation on opening night, Richards explained that as he worked beside builders on various projects, he recognized that he was guilty of making assumptions about their cultural tastes, education and politics, just as they passed judgment about his being an artist. But the common experience of a trip to the hardware store, plus a shot of hard liquor, can help turn foes into friends.